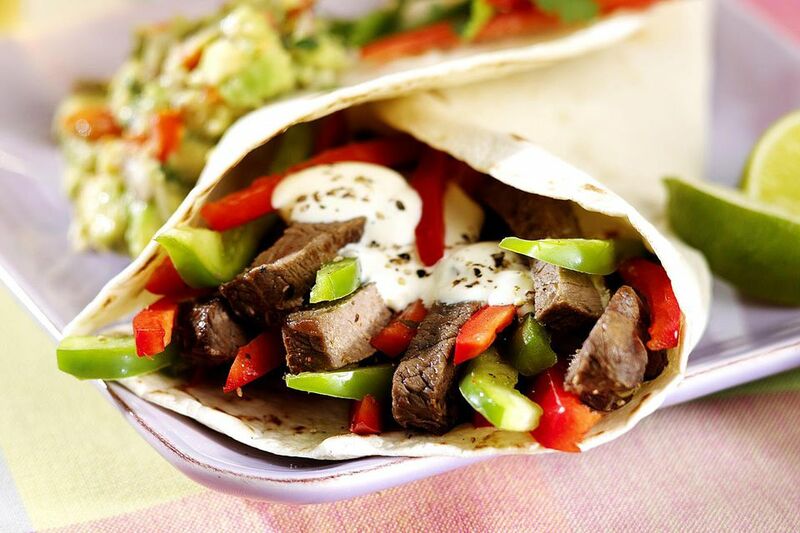 Steak fajitas are quick and easy to assemble. Marinating the meat overnight makes it tender and flavorful. This is a fun dish to serve because everyone can make their own using the toppings of their choice. Fajitas, derived from the Mexican word for skirt steak, were created by Mexican farmhands, who grilled this cut of meat, wrapped it in flour tortillas, and ate them out of hand. Although originally made with skirt steak, they now are made with everything from shrimp and lobster to portobello mushrooms. To make the marinade: In a 1-gallon zipper-lock food storage bag, mix the oil, lime zest, lime juice, Worcestershire sauce, garlic, chili powder, salt, and pepper. Add the flank steak. Close the bag, pressing out the air, and turn to coat. Refrigerate for at least 1 hour or up to 24 hours. Heat the oil in a large skillet over medium-high heat. Add the peppers and onion, and cook, stirring often, until tender, about 6 minutes. Preheat the oven to 350°F. Stack the tortillas ad wrap the tightly in a sheet of aluminum foil. Place the wrapped tortillas in the oven to heat for 8 to 10 minutes. Turn the oven off and keep the tortillas in the oven until ready to use. Preheat a gas grill to medium-high, or prepare a moderately hot charcoal grill fire. Grill the steak, covered, for 10 minutes on each side or until meat reaches desired doneness (for medium-rare, a meat thermometer should read 145°F; medium, 160°F; well-done, 170°F). Alternatively, preheat the broiler. Place the steak on a broiler-pan rack and broil 4 to 5 inches from the heat source for about 5 minutes on each side for medium-rare, 7 minutes on each side for medium. Remove the steak to a cutting board, and let it rest for 5 minutes. Reheat the peppers and onions. Thinly slice the steak across the grain. Place a few strips of meat in the center of each tortilla. Top with peppers and onion, lettuce, avocado, salsa, scallions, sour cream, and cilantro. Roll up and eat out of hand. • After the meat gets cooked, you should let it rest for a few minutes and cut it across the grain diagonally into thin strips. • Always warm up the tortilla before wrapping the fajitas. The warming up procedure will make the tortillas soft and tender. It will also enhance the flavor and taste. It is quite easy to warm up the tortillas – you can do it in your oven or microwave or on the pan.